Scientific experiments at the PNI facilities benefit drastically from the new opportunities being offered by state-of-the-art two- or three-dimensional detectors. 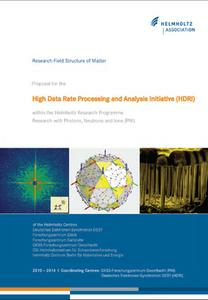 The data rates created by the rapidly progessing detector-developments pose at the same time strong challenges both for users and facilities. To cope with these challenges, the PNI facilitiesinitiated the HDRI initiative. With a collaborative and coordinated development and deployment of appropriate infrastructures and tools PNI-HDRI aims to meet extremely high data rates in a most efficient way. The scope of this initiative is outlined in the description of the workpackages. One of the major aims is to establish an online data evaluation system enabling feedback information for fast quality assurance during the course of an experiment, and hence for the most efficient use of valuable experimental time. Standards and policies are important elements of a sustainable data infrastructure. The initiative aims to establish a standard data format for an easy exchange of data and compatibility with evaluation software, and a data lifetime policy will be established for remote user access to large amounts of data as well as long-term archiving. Another challenging task is the development of simulation, modelling, and visualization tools enabling experimentalists to obtain scientific results from their samples faster, easier, and more reliably. It is envisaged that this initiative will be pursued in close collaboration with the PNI user community as well as other large-scale facilities for synchrotron radiation, neutron, and ion research outside PNI.